New Zealand joins the growing club of first movers tackling fossil fuel production! Who will be next? New Zealand joined a growing list of countries yesterday in announcing an end to fossil fuel exploration for the sake of the climate: Costa Rica, Ireland, France, and Belize are all working on plans to manage the decline of fossil fuel production, and there is little doubt that this is just the beginning. It is important to note that while this is a big move, it needs to kick off a series of actions that see an end to onshore licenses, and a plan to manage the decline of existing production. The Taranaki Basin is home to most of the country’s oil and gas production, and it is largely onshore. Nonetheless, acting on the need to put an end to offshore exploration is the direction of travel we need to be heading in, and this move protects more than 4 million square kilometres from any new fossil fuel exploitation. These “First Movers” are breaking critical new ground. Climate policy orthodoxy has meant that while the last two decades have been relatively flush with policies and efforts to tackle fossil fuel demand and consumption (efficiency regulations, carbon prices, clean fuel standards, etc. ), there have been no large-scale efforts to limit fossil fuel production. As intuition would suggest, this is a serious problem. It means that despite any success with demand side policies, at the same time, the fossil fuel industry has been exploring for and expanding new fossil fuel production. Once initial capital investments in those projects have been made, an effect called “lock-in” takes hold, meaning that companies will continue to produce until they are forcibly stopped by government regulation – because making some money on an investment is better than making no money. We must recognize that supply and demand are two sides of the same coin. Enter the First Movers. These countries understand that climate action needs a so-called “portfolio approach” – we need to tackle both supply and demand if we want to be successful in meeting the Paris goals. Make no mistake, this is the future – and present – of climate leadership. Climate leaders are no longer expanding or financing new fossil fuel development, and climate leaders are planning for a managed decline and just transition away from oil, gas, and coal production in line with the Paris goals. 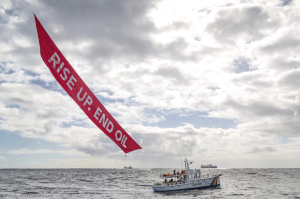 Some government-led financial institutions are even getting in on the action by recognizing the risks of investing in fossil fuel expansion, with the World Bank’s recent commitment to end finance for oil and gas extraction after 2019. The big question now: Who will be next? Will it be a steady stream of principled smaller-scale fossil fuel producers that signal a change in the direction of travel? Or will it be a large producer that steps up to set a global precedent and changes the climate conversation overnight? We hope it is both. But as the governor and the state gear up to host the Global Climate Action Summit in September, pressure is mounting and hopes are high for movement. 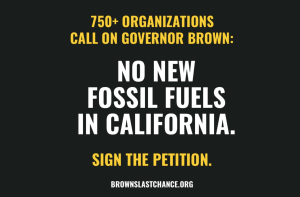 Yesterday – while New Zealand was announcing its exploration ban – over 750 groups from around the world sent a letter to Governor Brown calling on him to step up action on cutting fossil fuel supply in the state. The letter calls on the Governor to become a true climate leader by stopping the issuance of permits for new oil and gas wells, and by beginning a managed decline and just transition away from existing production, starting with wells within 2,500 feet of sensitive areas such as schools, homes, and hospitals. The letter delivery was accompanied by simultaneous press conferences in San Francisco and Los Angeles, billboards in San Francisco, Los Angeles and Sacramento, a full page ad in the state capital’s largest newspaper, and an airship with a banner pressuring the governor to take action on fossil fuel production. The activites mark the start of a five month campaign to push the governor to take action before the summit. Similar pressure is mounting in Canada in the face of the Kinder Morgan tar sands pipeline proposal, and in Norway where exploration for new oil stands in the way of the country’s climate legacy. The vanguard potential is clear and there is a standing invitation to the right side of history. Who will be next to accept it?